Zach and Amber’s baby was born with a rare condition which the doctors told them was called craniopagus parasiticus. This meant that their baby had two heads. Or–more properly–it meant that there had once been two babies, conjoined twins, but the second one had failed to develop completely. They were connected by the fused crowns of their skulls, and shared a small portion of the parietal lobes of their brains. The second twin, which was called the “parasitic” twin, had a head and a neck but didn’t really have a body. The neck stump below the head contained fragments of bone and vestiges of a heart and lungs, and there were tiny buds attached to the neck that were the beginnings of limbs. Nevertheless the head of the second twin was perfectly formed, with a beautiful little face. One reporter called them to ask whether they had given the parasitic head a name, and Zach sat there at the kitchen table, hesitating. Across from him, Amber appeared to be watching her folded hands, her face blank. Not long after this, he was driving home from the hospital. Should they have given the other head a name? he was wondering. This was a little after ten o’clock at night. It was snowing slowly, and the headlights of the cars shimmered in a way that struck him as particularly vivid. Even the white trail of steam from the steel plant seemed deliberate and painterly, but perhaps that was because he was so tired, perhaps the world was already half in dream. Amber was asleep back at the house. When he got home, they would lie together in the same bed for a few hours, and then he would get up and go to work. In the few months since the birth they had honed their routines, their daily schedules, their lives separate and divided into hours and half-hours and posted side by side on the refrigerator. In his dream, Zach pulled into the snow-boughed, pine-shaded driveway and pressed the button so that the automated garage door lifted gently open. Things seemed almost normal, almost like they were before Rosalie. His keys jingled as he unlocked the back door and stepped into the darkened kitchen, where the yellow tabby cat was sitting on the counter, blinking solemnly at him in the moonlight. He slipped off his shoes at the foot of the staircase and began to undress as he ascended, slipping off his shirt and unbuckling his belt and feeling his way down the hallway toward their room, where the bed was waiting with his wife curled up and warm on the right hand side, and she would sit up and smile, squinting sleepily, tenderly, pulling a strand of her hair away from her lips. He was just about to bend down to kiss her when his car went off the road. He was only dreaming that he was home, he realized. He had fallen asleep while driving his vehicle and he awakened with a start as the steering wheel lurched beneath his hands. His head jerked up just in time to see a sign fly up over the hood and past the windshield, and he watched in surprise as the red octagon with the word STOP printed on it lifted up and whisked away over his head like a balloon. Then the windshield smashed, and the car hit a tree, and the safety airbag punched him in the face as it expanded, blocking out his vision. In her bassinet, baby Rosalie was asleep, though the other head, the parasitic head, was apparently alert. Was it conscious? The other head seemed to sleep less than Rosalie did, and even late at night the nurses would find it blinking slowly and gazing serenely into the darkness, peacefully awake. The other head didn’t seem to be in pain, the way Rosalie often was. While Rosalie balled her fists and scrunched her face and screamed, sometimes quivering with what appeared to be agony, the other head let its eyes drift along the ceiling, its mouth puckered and moving as if nursing. Zach had often wondered what was going on inside their brains. Could they dream one another’s dreams, think one another’s thoughts? Could they see what the other one saw, the two pairs of eyes looking at the world both right side up and upside down? Or perhaps they weren’t aware of one another whatsoever. After all, they couldn’t see one another, they’d never looked in a mirror. To Zach, this was a terrible thought–that they had no idea that anything was wrong. It was awful to think that the babies both assumed that this was the way the world was supposed to be. Of course, he realized that this probably wasn’t an accurate way to think about things. He knew that it was not appropriate to attempt to interpret the various expressions and glances that passed across the faces. According to the doctors, the other head was probably blind and almost undoubtedly had very low levels of brain function. It had no thoughts or feelings. So great. I cannot wait to read more of this story. 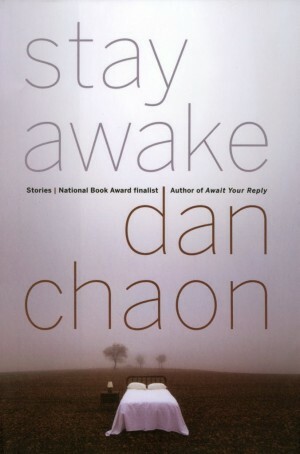 Since I’ve already pre-ordered “Stay Awake,” I thankfully only have to wait until February 7th to read the rest of this. Everything you write makes my chest feel tight. It’s almost an addiction. Hypnotic. How’d you do that? Wow. A thrill to have you here, Dan.